The Xbox App now streams directly to Beam. Broadcasting live gameplay to Twitch or Facebook isn't easy. It means setting up special capture software and navigating a mire of complicated bandwidth settings. Microsoft is trying to fix that: The next version of Windows 10 is going to integrate game broadcasting directly into the Xbox App. The streaming experience promises not only to be easy, but also to almost eliminate the communication lag between viewers and broadcasters -- but don't expect to use it on Twitch. Microsoft's game broadcasting tools seem to be designed specifically for Beam, the livestreaming service it acquired back in August. If you're not familiar, Beam was a start-up streaming service that let viewers more directly interact with a broadcaster's game -- allowing them to choose what weapon they might use next or select what weapon the player will have next. Microsoft bought the company earlier this year, and seems to be positioning it as the default streaming platform for Windows. 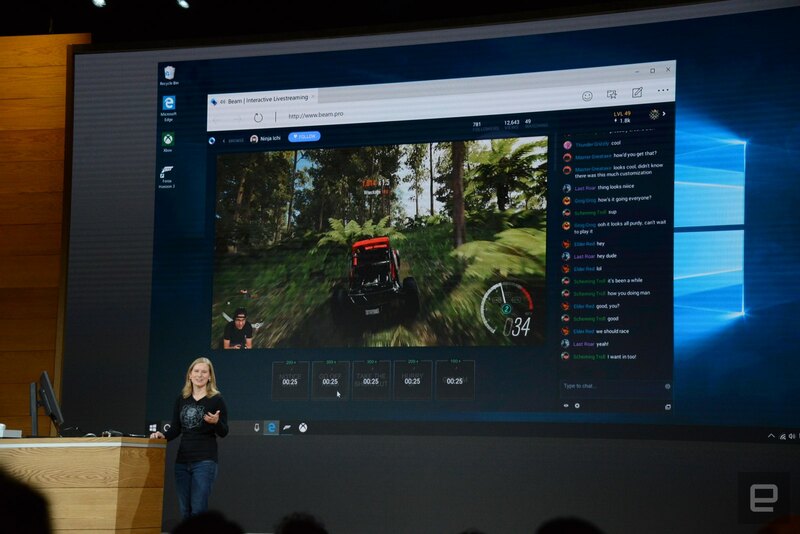 Starting with the Windows 10 creators update, gamers will be able to start a broadcast to Beam by pressing the Windows button and the 'G' key, giving them an instant streaming overlay with a preview of their stream and a community chat window. That's great on its own, but the real selling point is Beam's low-latency streams, which let players watch gameplay in near-realtime and gives broadcasters the ability to respond to chat messages almost instantly. Beam users are also be able to send audio commands that ask the broadcaster to pay attention to the chat window, or take a specific action in the game. Microsoft hasn't said if the Xbox App's streaming tools will work with other streaming services, but it definitely seems like a simpler way to broadcast gameplay. Unfortunately, if you're not a member of the Windows Insider program you'll have to wait a while before trying it out -- the streaming update doesn't officially arrive until Windows 10's Creators Update launches early next year.